A recent post on The Nick & Artie Show’s Facebook page seems to point to what fans had been thinking all week. You guys have been great detectives on trying to figure out what the new situation will be starting on Monday,” reads the Facebook entry, posted earlier this afternoon. 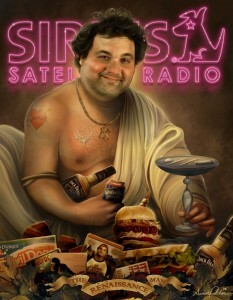 “Nick is pursuing some great opportunities and we are excited to announce the NEW Artie Lange Show. What made the transition suspicious was a purchase of the domain name Artielangeshow.com,which was registered to a person under the name Ken Kohl. Kohl is the director of operations for the entertainment division of DirecTV, the hub of former The Nick & Artie Show. Their prior website seems to be taken offline and just shows a under construction page. Di Paolo commented Friday morning that he couldn’t say anything about situation just yet. Remembering Artie Lange on the Stern Show, some of the best moments and fights with Howard and the staff. Howard Stern never heard of Alex Jones before? Boy…….when you put these clips together, it makes it easier to see what a self-centered prick Artie actually is. Glad he’s gone. Hey man, I heard Alex Jones saying that Howard and Robin were defending him on air about the Piers Morgan situation. Could you find it and post it? Cheers! Sure, Ive been a fan of radio broadcasting for many years and heard of Alex Jones back in 2005. Alex Jones seems to be one of the most blacklisted radio broadcasters, its hard to find another dj that will even mention his name.